February 1, 2019 – Simply put, strategic planning defines where a practice is heading over the next year or more and how it’s going to get there. Although this seemingly simple task can often become a daunting exercise once started, if performed within certain guidelines, the benefits are significant. First and foremost, complete and open communication is mandatory. Too often, only a select few, typically upper management, may even be aware that the practice is conducting a strategic planning initiative. Closely related to this is the necessity to include representatives from all facets of the organization in the planning process to gain insight from all perspectives. Often the “voice of the customer (patients, family members, referring doctors)” is also solicited to help weigh into long-term direction. The entire key to success, quite simple defined as actually implementing the resulting strategic plan, is to gain full alignment between where you want to go and the things you do to get there. Defining very clearly the strategic profile, or the “tip of the funnel” of the practice is the first step. 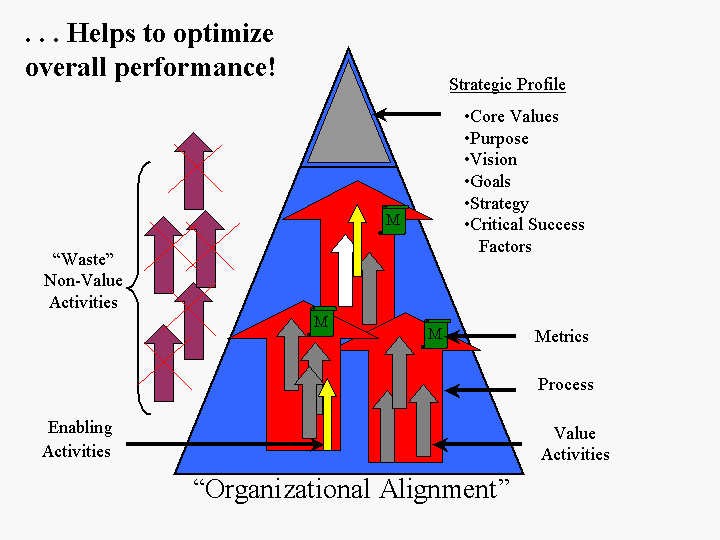 (Refer to Organizational Alignment graphic.) The strategic profile describes the organizations core values (“our key beliefs that will never change over time”), the vision (“how we see ourselves in the future”) the purpose (“typically our mission”), the mid-to-long-term goals and the strategies to achieve (“our plans in how best to attain our goals”). To illustrate, consider the following example of a multi-physician practice. The practice was suffering from stagnant partner profits, morale issues, group conflict, scheduling delays and poor response time to patient calls. New patients were turned away because the practice could not legitimately handle more. Wishing to improve the overall performance of the practice, the managing partner with the assistance of the practice administrator determined that the root cause of their issues was an ill-defined practice strategic profile and immediately began an initiative to develop the long-term vision with a carefully defined set of goals for the upcoming year. She then wanted to be sure that the day-to-day activities were aligned with where the practice wanted to go. This necessitated re-defining staff roles and responsibilities, modifying scheduling policies and patient-flow, removing process waste and inefficiency, redirecting practice resources (i.e. people’s time) to patient care activities, and establishing process metrics to accurately measure the results. As a result, there was increased time available for nursing staff to provide patient education, standard procedures were created and workflow variability was removed, and more accurate coding reduced claim denials yielding improved cash flow. Almost immediately the practice realized increased patient visitation capacity and throughout the year, accepted new patients yielding triple digit increases in added annual revenue. In summary, a well-planned strategic plan should always provide the tools necessary to ensure that the day-to-day activities are fully in sync with the “big picture”, and provide performance metrics that measure not only the success of implementation but also the sustainability of the plan into the future. A Partner with Dopkins & Company, LLP, Ralph's specialty focuses on serving Non-Profit agencies within the health and human service industry as well as medical practices. Ralph has also developed a unique expertise in the design and implementation of custom performance management and improvement solutions primarily for service-based entities. As an expert facilitator of organizational change, he has had significant experience and success in leading organizational change management for his clients utilizing his skills in strategic planning, lean/six-sigma, activity-based cost/management, performance measurement, and other related performance improvement methodologies.